Preheat an oven to 300 degrees. Place the tomatoes in a roasting pan and cook until dry and shriveled, about 25 minutes. To prepare the cauliflower, take one cups worth and steam until very tender. Allow to cool slightly and then puree with 1/4 c of water. Set aside. Cut the other two cups of cauliflower into bite sized florets. Combine the wine, lemon juice and zest, olive oil, 1 clove of garlic, and salt and pepper. Mix well and pour over the scallops to marinate. Allow to sit for 30 minutes. Brown the butter in a sauce pan, and set aside. For the risotto, bring your 1 qt of liquid to a boil. In a saucepan, cook the pancetta or bacon over medium heat until crispy. Add the onion and fennel to the pan and sweat for 3 minutes. Put in the garlic and rice and stir to cook for 1 full minute. Add enough of the boiling water to cover the rice, along with the cauliflower puree. Stir the rice constantly, adding more liquid as the pan dries out, until the rice is almost cooked. Add in the florets and roasted tomatoes and cook until cauliflower is tender. Take off the heat and stir in the cheese. Adjust seasoning with salt to your taste. Remove the scallops from the marinade and heat a sauté pan over medium heat. Pour the marinade into a sauce pan and cook to reduce until there is 1/4 c remaining. Pour in the browned butter and mix to combine. Using a small amount of oil, sear the scallops for 1 minute on each side, or until just cooked through. 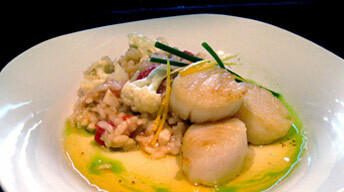 Serve the scallops over the risotto and drizzle with the lemon butter.